The biggest U.S. music service on the Web in December was Vevo, a new entrant which is a joint venture between Google, Universal Music Group, and Sony Music. 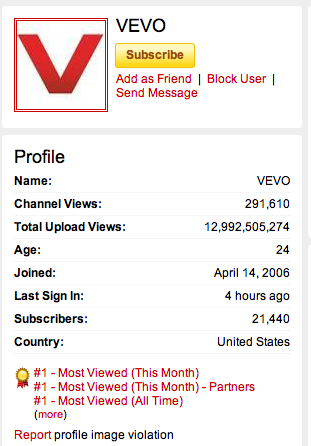 Dubbed the “Hulu of music videos,” Vevo attracted 35.4 million unique visitors in December, 2009, putting it above the 33.1 million visitors who went to MySpace Music, according to estimates put out today by comScore. Considering that Vevo only launched on December 8, that is a pretty good showing. A closer look at the numbers shows, that nearly all of that audience came from YouTube, which hosts a Vevo channel. Of the 35.4 million visitors which comScore counts for Vevo, 32.6 million (or 92 percent) are attributed to YouTube. In one fell blow, YouTube has helped to push MySpace Music from the No. 1 spot. Not only does this illustrate the distribution might of YouTube, but it also shows how professional content is still hard to beat, even on YouTube. The Vevo channel is already the most viewed channel on YouTube, with nearly 13 billion views across all Vevo and all of Vevo’s sub-sites, which include the individual artist channels for Lady Gaga, Kings of Leon, Timbaland, and many others. Here are the top ten music services as measured by comScore in unique U.S. visitors for December, 2009. The only real startup is Jango (No.7), with 9.6 million, but the comScore numbers include some lyric sites it also owns. ToneFuse Music, No. 8, is almost entirely a collection of lyric sites. Rhapsody rounds out No. 10 with 6.5 million (Last.fm would be No. 11 with 6 million).